Cool. New concern: the guide has no Wind magic. What should a prospective Tiercian Wind Mage do about that? Copy the available Fire spell but cross out the name? Another thing, this time about the weapon triangle, still about magic. Are we going with the Fire beats Wind beats Thunder beats Fire triangle from the games, or the Anima>Light>Dark triangle implied at the bottom of page five? And if we're going with the first choice, what relationship will Dark and Light have to it? Answered in reverse order: The Anima triangle I'm not including cause it would require a lot of weapon creation/integration into the existing system. Also cause that same system makes playing fliers miserable (cause lightning magic gets "effective" vs wyverns and wind magic gets "effective" vs pegasi, the latter of which continues to baffle me.) If I were, the anima triangle generally ends up being a sub triangle only within anima magic. It's still all anima magic so it'd fit in the same place within the magic triangle. For flavor purposes if people want to rename their low level books to different elements I'm cool with it. Appearance: The seas that the Naranja call home shape people in very distinct ways. Always heavily tanned and with leathery hands from maintaining the ships they live on, Vanessa is no exception. Well muscled from both the work and learning to wield the axe she hefts with ease, there is always the air about her that she has no qualms picking a fight if it suits her fancy. Her hair, a bright red, is kept short. Pirates fight dirty and she's not about to give them another tool to use against her. Vanessa is almost always at Morgan's side and while they interact like close friends, there's always that flash behind her green eyes that she's keeping an eye on the young mage, either due to the Laconic Curse or some history behind the two. In case it wasn't clear, non-lord characters are built on 300% growth rates, Lords on 320%. Last edited by DanteFalcon; 02-13-2016 at 12:44 AM. Can I get an idea of where people are at? Not rushing people, but curious about if people are waiting on something or if there's a common hangup I can help out with. Right now I've got a fair bit of the character done, including all of the stats. So far I'm a little curious what everyone else has produced, and right now am just needing a little inspiration for the rest of the story, but character is mostly complete. Haven't had a great chance to look at the Primer, have now and have a character concept in mind for a Mercenary, Troubadour pair. Should be fun. I've got my shaman's stats set-up, and I know what kind of characters both of my guys are, I've just been busy with my new job. I can maybe get them out late tomorrow, but I can't promise that. Er, if it helps anyone, the shaman is going to be an old man, former tattoo artist with mad tats and no hair, and the wyvern rider is going to be a young man sworn to protect him with a taste for violence and a disdain for art. Gotta make my odd couples. I'm not trying to rush people so don't worry about that, I'm fine with a slow pace. Just wanted to make sure we were all okay. My pair is going to be brothers, whom sell themselves as mercenary fighters. One a confident and capable fighter who serves as the more tactical of the pair, the other a conniving healer who is more strategic in thought. Both not exactly good people. 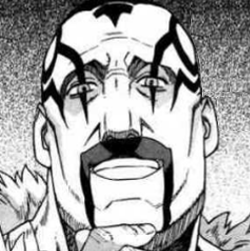 Your suggested bald old man tattoo artist made me think of Geranpen from Ubel Blatt manga. Although he might be more muscular and less "aged" than you intended. EDIT: Aw, for some reason the forum isn't letting me directly post image on forum. Ah well, the links work well enough. Last edited by Menarker; 02-17-2016 at 03:45 PM. You know, I think his darkness tentacles probably had some unconscious influence on the first mote of the character's concept, but then I was like "But 'tribal' whirligig tattoos are boring and cliche," and stuff went from there. The server time is now 08:07:29 PM.